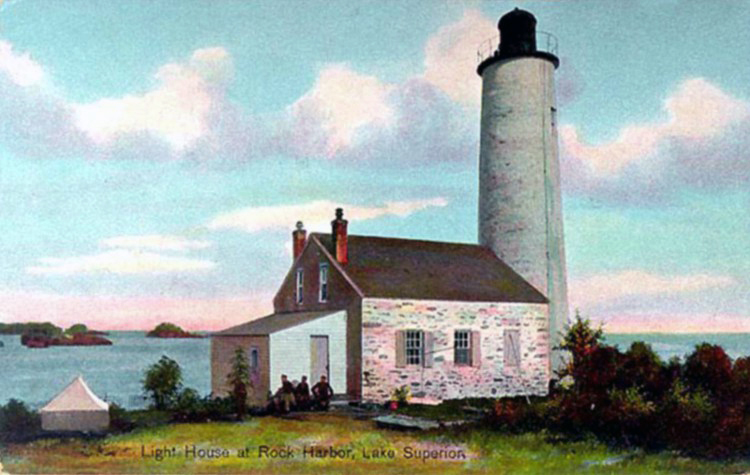 Built in 1856, the Rock Harbor Lighthouse, a rubble-stone tower nearly fifty feet high with a domed copper roof, sports a fourth-order Fresnel lens. It operated for three years before being abandoned by its keeper after mining operations closed and marine traffic declined. 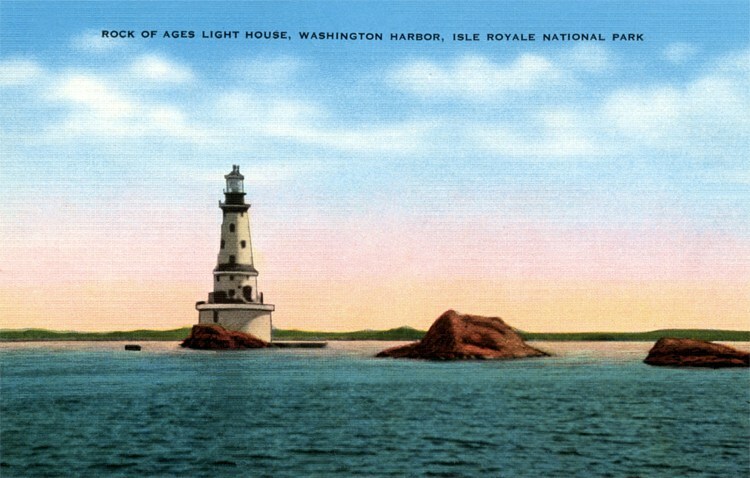 It was reopened following a renovation in 1873, but eventually shut down again in 1879 after the Menagerie Island Lighthouse, built in 1875, rendered the Rock Harbor light unnecessary. In the 1930s it was used as a base of operation for a few fishermen and had to be stabilized in the 1950s to prevent it from tipping over. Located off the northeastern tip of Isle Royale, Passage Island Lighthouse was built in 1881 using $5,000 appropriated by Congress. Blueprints for the structure duplicate those of earlier light stations built elsewhere using the Norman Gothic style. The two-story structure was made of fieldstone and boasts a fourth-order Fresnel lens. In 1882 a 1,500-pound steam-powered fog bell was installed; in 1895 keepers shoveled thirty-five tons of coal that kept the whistle blowing for 755 hours. 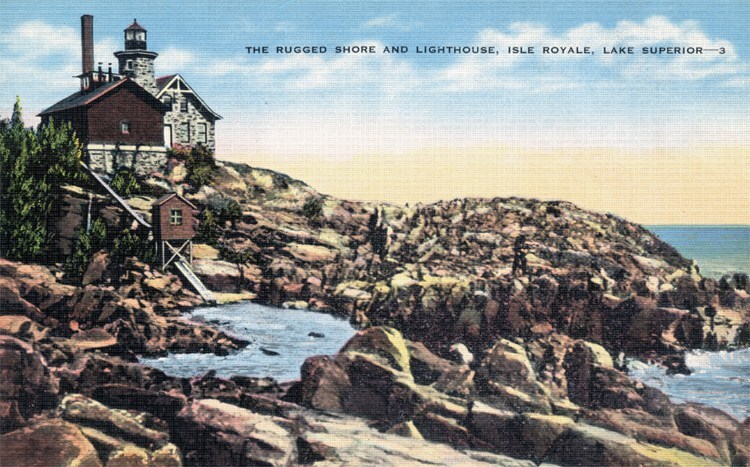 (The whistle would later be moved to the lighthouse at Grand Marais.) The lighthouse still helps watercraft navigate the lake, but its Fresnel lens was replaced by an acrylic optic lens in 1998. The Rock of Ages Lighthouse sits on a rock outcropping about two-and-a-half miles from the southwestern tip of Isle Royale. After local authorities spent many frustrating years trying to convince Congress of a need for the light, it was finally built between 1908 and 1909 at a cost of $115,000. It stands eight stories high, providing ample room for the keeper and his assistant, and the entire building was heated by a steam plant located in the structure’s upper cellar. Four keepers were assigned to the light, and each received a week of leave each month. In 1933 the George M. Cox rammed a nearby reef in heavy fog, and the keepers saved all 125 passengers and crew members.